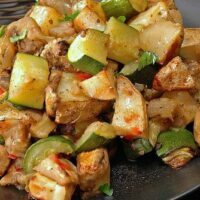 Chicken and Eggplant Stir-Fry contains ground chicken and cubed eggplant along with lots of spices to make it especially delicious. 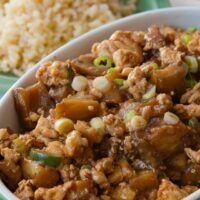 This recipe is a clone of a menu item PF Changs no longer offers. (sniff, sniff) Serve over rice. What do your favorite lipstick colors and favorite restaurant dishes have in common? They can disappear without notice or explanation. Right? Sooo frustrating! That’s what happened to this Chicken and Eggplant Stir-Fry at a PF Changs restaurant close to our house. Gone from the menu! No warning or notice. Nobody even asked our opinion. In spite of the absence on the menu, we were able to get it by special request for a while. Not anymore. What else can a person do? Now I must recreate this delicacy in my own kitchen. No. This isn’t the exact recipe. Unfortunately, I’m not friends with the chef. In the end, we love it and it’s another way to get more veggies, and specifically, more eggplant. On the positive side, I can make it cheaper and healthier if I choose. For starters, I’m pretty sure the restaurant deep-fried the eggplant. It comes in huge sturdy chunks and is really flavorful. Instead, I stir-fry the eggplant to give it some color. Stop short of cooking until it turns to mush. The sauce is SPICY. 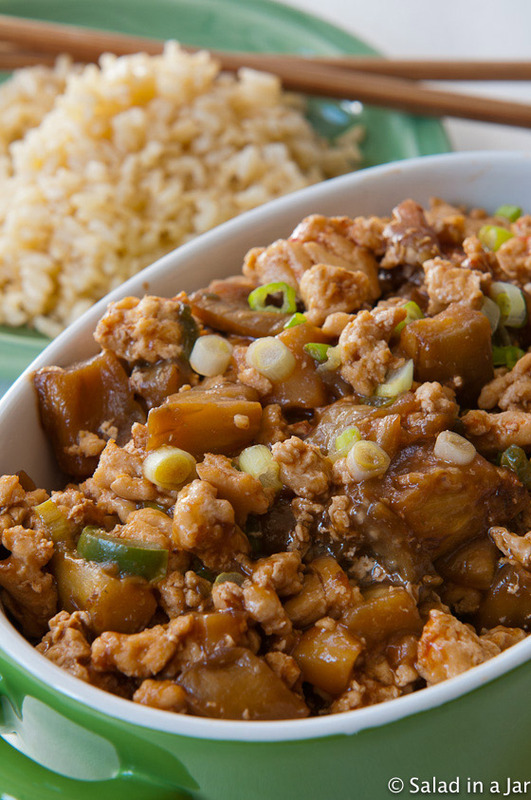 It needs to be to counteract the relative blandness of ground chicken and eggplant. Again, it’s easy to adjust the spiciness to your own preferences. If you have eaten this dish at the restaurant and then try this recipe, I would love to know your reaction. Did I come close? Anything missing? Whisk together broth, vinegar, cornstarch, oyster sauce, tomato paste and Sriracha in a medium bowl and set aside. 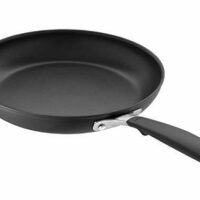 Add 3 tablespoons oil to large, preheated nonstick skillet. When oil begins to smoke, add eggplant and saute until all sides are golden brown. Stir in soy sauce. 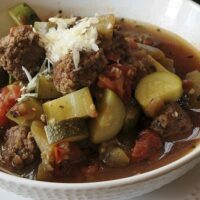 Remove eggplant cubes from skillet to a separate dish. Add remaining tablespoon of oil to now empty skillet. When oil is shimmering, add ground chicken and break up with a spatula. Fry until chicken is nicely browned. Add jalapeno pepper, garlic, and ginger to meat while continuing to stir occasionally for 2-3 minutes. 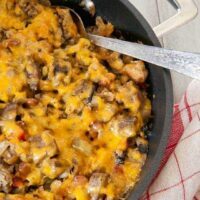 Add sauce to skillet containing chicken. Return eggplant to the skillet and continue to cook until sauce thickens. Sprinkle scallions over the top as garnish. Serve with rice. I like to grind my own chicken. 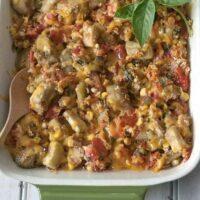 It's a great way to use frozen chicken breasts that have been in the freezer a little too long and have some freezer burn to show for it. Let frozen chicken (boneless and skinless) thaw slightly. Cut in smaller chunks and place in a food processor. Pulse until chicken is ground like ground beef you would buy at the store. Be careful not to grind too much. You don't want mush. Ground turkey is an acceptable substitute for the chicken.